Anyone who has made a simple budget has struggled with making their food budget fit with the rest of the budget. If you attempt to eat healthy, one of the biggest components to a food budget is the produce. Stretching your produce budget can be somewhat difficult. Growing seasons are short, and the cost of produce keeps going up. But, there are a few things we can do to stretch that produce budget, and make it a bit easier on your overall budget. Stock Up on Sale: buying your produce on sale allows for you to stock up when the item is cheaper, then store it until you need it. Canned produce is really easy to store. Frozen only requires a freezer. And if it’s the fresh stuff, there’s a few things you can do to store a surplus when you do pick it up in season and on sale. Canning for stockpiling: When you’ve got a surplus of produce, one of the best things you can do is can it to preserve it for another day’s use. Canning only requires a few pieces of equipment, and a little time learning the process, then you can be off to the races filling your pantry shelves with preserved fresh produce to use later in the year when produce is much more expensive. Freeze it: Every year, around the end of summer, corn pops up in the backs of pickup trucks and in the farmers markets. Compared to the rest of the year, it’s really cheap, and it tastes so good! Unless we want to eat nothing but fresh corn, though, the season is fleeting, and we’re left with no other corn but the commercially canned or frozen corn you can get at the supermarket. It’s just not the same. Last year, we bought a whole bunch of corn (4-5 dozen), shucked them all, then cut the kernels off and combined them in a huge stockpot with some butter, a little bit of salt, and a little bit of water, and then cooked it for a little while. Once it was done, we let it cool off, and then filled quart size freezer bags with the corn and froze it. Now, if we want a little taste of that sweet summer corn, we just grab a bag, heat it backup and eat. We did similar things with pumpkin, squash, zucchini, and a whole bunch of other summer fruits and veggies. All it takes is a little bit of prep time and the freezer room to enjoy the flavor of fresh produce all year round. Grow it: If you already grow a garden every year, this might seem like a no-brainer of a tip. But, growing your own garden can be an excellent way to stretch your produce budget out. Last year, we enjoyed an abundance of tomatoes, potatoes, carrots, onions, jalepenos, cucumbers, and even an eggplant or two from our tiny container garden. This year, we’re planning on consolidating down to a smaller selection in hopes that we’ll have some extras that we can can as well. Find a Farmer’s Market: Buying your produce from a local farmer can often be just as cheap as buying at the supermarket. In some cases, if you order ahead, you can get a deal on bulk orders of produce which is great if you are planning on canning any of it. It’s also fresher since it only had to make the trip from the farm down the road instead of the farm across the country. It’s not always a great way to stretch the produce budget, but if you want high-quality produce that will last longer before spoiling, it’s a good place to check out. Pick it Yourself: A reader on twitter commented that I’d forgotten to add the u-pick farms. I hadn’t really forgotten them, as they just don’t exist in my neck of the woods and the cost to drive to the nearest one would negate the savings. But, if you have a u-pick farm nearby, it’s an excellent way to get out of the house, pick a ton of fresh produce (fruits usually) and save a pretty big chunk of change. Many of the farms only charge about 1/3 of the cost at the grocery store! Extending your produce budget is important, not just when there are droughts, but as a way to provide healthy options for you and your family to eat year round. 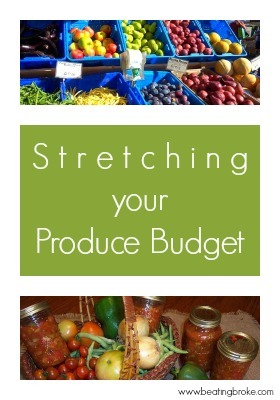 What do you do to stretch your produce budget? Is Not Keeping Up with the Joneses Boring? We’ve been on a journey to pay off our debt for 3.5 years now. At first, we were gazelle intense, but then I burned out from working too hard, so we slowed down on the debt repayment. To make matters worse, in the first 3.5 months of 2015, we’ve faced $5,000 in unexpected car repairs and dental bills. The good news is that even though we haven’t made significant debt repayment progress over the last year, we’ve been able to pay for all of these most recent expenses in cash, without going further into debt. Basically, each year for the last 3.5 years, our budget has become tighter and tighter. We’ve definitely NOT kept up with the Joneses. Yet, we’ve not found this type of life boring. If anything, living this way makes us appreciate a “treat” that we used to take for granted. For instance, I homeschool my kids, and my daughters recently completed preschool and kindergarten. They were both very excited about moving on to kindergarten and first grade, respectively, so my husband and I decided to take the family out for a treat. We went to our favorite restaurant. We went for breakfast, so the bill would be cheaper, and we used a $25 gift card that we had gotten at Christmas and saved. Because we had not gone out to eat in about five months, the kids were beyond thrilled. All of us enjoyed the meal greatly. Because we haven’t gone out to eat in so long, doing so was a special treat. Before we got on a budget and started paying down debt, we often went out to eat three or four times a week. Honestly, because we did it so often, going out to eat had become boring. Now, because we don’t do it very often, we appreciate the meal when we do go out. Because we have simplified our lives, we are able to enjoy special occasions much more. Just because we aren’t keeping up with the Jones and are on a budget doesn’t mean we aren’t having fun. Just this week, my mom was in town for a visit. We took her to a national park, which had free admission that day. We watched artisans make homemade tortillas and weave baskets. We listened to a local band, and we got an excellent tour of the site. Before heading home, we enjoyed a picnic lunch on the grounds. Last month we went to the Tucson Festival of Books. There was so much to do (for free!) that we stayed over five hours. We could have stayed even longer. Going on a tight budget and deciding NOT to keep up with the Jones can be difficult at first. Now, however, we’ve done it for so many years that we find living this way actually improves our quality of life. 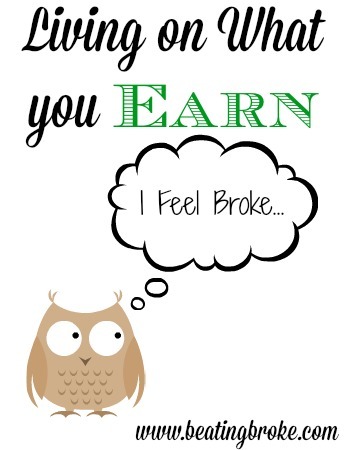 Living on What You Earn Can Make You Feel Broke, and That’s a Good Thing! Living on what you earn can be a difficult thing. For many, it seems like a little like a foreign language; difficult to learn to do, and backwards. But, if you can learn it, and transform your life into one where you’re living on what you earn, it can make a whole lot of difference. You’ve got to start somewhere, though. I, like you, haven’t always lived on what I earned. Almost all of my life, I’ve owed someone something. When I was 19, I needed a car. My parents, tired of having me call them late at night after my old, beater car had broken down—AGAIN!—, decided I should buy a new car. I didn’t qualify for a loan yet, so my grandpa lent me the money, and I paid him back with a small amount of interest, which was less than I’d pay borrowing from the bank and more than he’d make in a safe investment. Soon after, I went away to college and took out student loans and started running a balance on my credit cards. By the time I finally paid off my student loans a few years ago, my husband had his own loans that we had to pay. Can you see me, just like the proverbial hamster running on the hamster wheel? I owe, I owe, it’s off to work I go. Time to live on what we make. And that’s when the real challenge began. Our society is built on borrowing. Borrow for school, borrow for a car, borrow for a house, rent to own, pay in 10 easy installment plans. I’m done living that lifestyle, but in turn, I’ve picked a much more challenging lifestyle—living on what we earn. The first thing I did was develop a frugal, written budget. That meant taming our grocery budget from $700 to $1,000 a month to $500 a month to feed our family of 5 with gluten, dairy and corn intolerances. It isn’t easy, but we’re doing it. The next step was to keep a record of everything we spend. Honestly, I hate keeping this record, so that alone is incentive to spend less. I spend an hour or so every week, reconciling the budget and making sure we’re on track. I also started regularly saving for irregular expenses. Every other week, I put $120 in an account earmarked for utilities. In the winter, our utilities fall far below that, but I still keep saving the money for the expensive summer months. This way our utility costs are the same all year long. While the new budget can feel somewhat restrictive, what I find most difficult are the unexpected expenses. Just recently, I found that two of my kids have cavities (quite a few! ), and the price for fixing them is around $400. I have money set aside in a medical fund, but filling the cavities will just about wipe that money out. The problem is that we have many other medical expenses–$188 for my son to get new glasses and an eye exam and a pending $3,300 expense for him to get braces. I could put his braces on an interest free payment plan, but we don’t do payment plans anymore, interest free or not. Instead, we had to make hard decisions like canceling our trip to see family this summer. Living on cash is definitely not easy, but I know once we get through the next couple of years, as our income increases, it will get easier. Do you eschew debts and payment plans, or do you use them in moderation to meet your goals?